In my last post on equity risk premiums and the market, I argued that the equity markets have been priced on the presumption that the Fed has the power to control where interest rates will go in the next few years. Wednesday’s press conference by Ben Bernanke was a perfect example of how the Fed has become the center of the equity market universe and how every signal (intentional, implied or imagined) of what the Fed plans to do in the future causes large market gyrations. Ben Bernanke’s press conference was at the end of the meetings of the Federal Open Markets Committee (FOMC) and it provided an opportunity for the market to observe the Fed’s views of the state of theeconomy and its plans for the foreseeable future. The Fed’s optimistic take on the economy (that it was on the mend) and Bernanke’s statement that the Fed could start winding down its bond buying program (and by extension, its policy of keeping interest rates low) was not viewed as good news by the market. The reaction was swift, with stocks collapsingin the two hours of trading after the Bernanke news conference and rippleeffects spreading to other global markets over night. Implicit in this reaction is the belief that the Fed is an all-powerful entity that can choose to keep interest rates (short term and long term) low, if it so desires, for as long as it wants. While this belief in the Fed’s power to set interest rates is touching, I think it is at war with both history and fundamentals. In fact, if there is blame to be assigned for the market collapse, it has to to rest just as much on investors who have priced contradictory assumptions into stock prices as it does on the Fed for encouraging them to do so. As with any asset, the treasury bond market sets prices (and yields) based upon demand and supply, with perception, expectations and behavioral factors all playing a role in the ultimate price (and rate). Holding all else constant, then, it seems obvious that the Fed with its bond buying program can change the dynamics of the market, increasing bond prices and lowering long term rates. Note that the actual inflation rate in each year and the real GDP growth in that year are aggregated to yield the fundamental interest rate. Thus, in 2006, the actual inflation rate was 2.52% and the real GDP was 2.38%, yielding a fundamental interest rate of 4.90%. Comparing it to the ten-year treasury bond rate that year of 4.56% yields a gap of -0.34% (T.Bond rate - Fundamental interest rate). There are two conclusions I would draw from this graph. 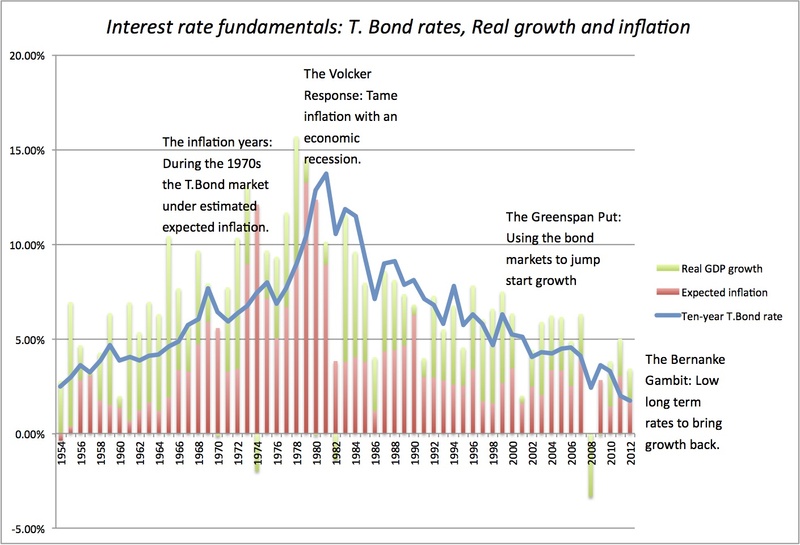 Over the 1954-2012 time period, the actual T.Bond rate has moved, for the most part, with the fundamental interest rate, rising in the 1970s as inflation surged and dropping in the 1980s as inflation retreated. There have been gaps that open up between the treasury bond rate and the fundamental interest rate but they seem to close over time. In fact, when the T.Bond rate increases (decreases) relative to fundamental interest rate, the treasury bond rate is more likely to fall (increase) in the next period. Across the entire time period (1954-2012), the 10-year treasury bond rate averaged 6.11% and the fundamental interest rate average 6.83%, but breaking down into sub-periods suggest that there has been a shift in the relationship over time. 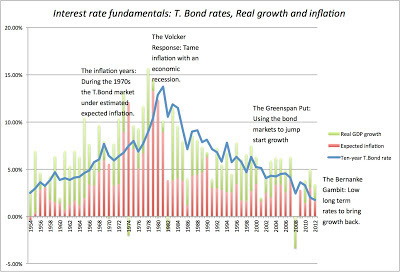 In the 1954-1980 time period, T.Bond rates were 2.20% lower, on average, than the fundamental interest rates but in the 1981-2012 time period, the average treasury bond rate has been 0.52% higher than fundamental interest rates. In January 2013, the treasury bond rate at 1.72% was about half the fundamental growth rate of 3.43% (Inflation in 2013 of 1.76% + Real GDP growth of 1.67% = 3.43%). 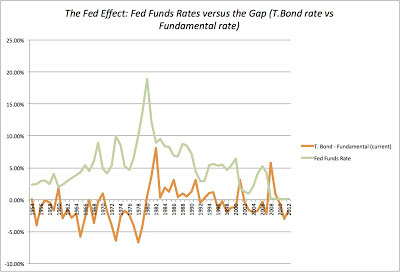 Not only is the gap of 1.71% high by historical standards, but the ratio of the T.Bond rate to the Fundamental interest rate was close to historic lows (the lowest was 2011, when the T.Bond rate was 40% of the fundamental interest rate). If you are interested, you can download the raw data on interest rates, inflation and real GDP growth and come to your own conclusions. Put in more intuitive terms, based on the historical data, a cut in the Fed funds rate of 1% decreases the gap between the T.Bond rate and the fundamental growth rate by 0.53%. There are two sobering notes worth emphasizing. The first is that the Fed funds rate currently is close to zero and that effectively implies that its use as tool to make T.Bond rates decrease relative to fundamental growth rates is limited. (I know that the Fed has been much active with the other tool in its war chest, bond buying, but that tool too has its limits). The second is that the Fed is not as powerful at setting interest rates as most investors think. Only 14.33% of the variation in the gap can be explained by the Fed funds rate and changes in real growth & inflation have far bigger impacts. Is that Ben Bernanke I see behind the curtain and is that contraption the Fed's vaunted interest rate setting machine? If the T.Bond rate does rise next year towards the fundamental interest rate, it will ironically make investors attribute even more power to the Fed, since it will coincide with the winding down of the bond buyback by the Fed. The Fed, we will be told, allowed long term interest rates to rise by using it extensive powers. Here is what I believe. Thus, if the economy improves, interest rates will rise, with or without the Fed buying bonds and if the economy falters, interest rates will stay low, with our without the Fed buying bonds. As my last two posts on the market indicate, my biggest concern with markets right now is that investors may be pricing inconsistent assumptions about the macro environment. In other words, investors are pricing stocks on the assumption that the US economy will return to growth, while interest rates stay low. While each assumption can be defended separately, I don’t see how they can co-exist, no matter what the Fed or any other entity may tell us. There are two things to note about these scenarios. The first that some of these scenarios are more likely than others, though I am sure that opinions will vary about which one. For instance, the soft landing scenario, favored by many economists/investors today, sees moderate growth with low inflation, one that is negative for bonds (because interest rates will start creeping back towards the fundamental growth rate) and mildly positive for stocks. I think that the high real growth/deflation scenario is unlikely, since it is difficult to see the economy growing at a robust rate and prices falling at the same time (especially given monetary policy over the last few years). I also have to believe (and perhaps hope is winning out here) that the negative real growth/deflation scenario has a low chance of occurring, and it would be very negative for stocks, though it will help bond holders. The second is that there are far more scenarios which are negative for bonds than positive, a direct result of interest rates being at historic lows and the Fed running low on ammunition. My personal investing foibles should be of little interest to you, but I have tried to build in some degree of protection into my overall portfolio, especially against interest rate changes. A few weeks ago, I invested in ProShares UltraShort 20+ year (TBT), an ETF that sells short (with leverage) on long term treasuries; it is one of many ETFs that offers this choice. (As some of my readers have pointed out, the ultrashort funds come with baggage. For those who prefer a more predictable play, go with TBF, which also shorts the treasury bond, but without leverage). I did not buy full protection against interest rate changes, since that would have required me to invest a huge amount of my portfolio in this ETF and because I don't attach a high probability to the most disastrous scenarios for bonds. The partial protection that I did buy has worked as advertised. That may not be your preference, either because your assessment of the likelihood of the scenarios will be different from mine or because you feel that there is a different asset class (gold, emerging market equities etc.) that will provide you better protection. In my view, the one scenario that is unlikely to unfold, no matter how much you wish it to be true, is the one where real economic growth (2-2.5%) returns, inflation stays at moderate levels (2-2.5%) and the 10-year treasury bond rate stays at 2%. I understand that the Fed is doing a difficult job (that the executive and legislate branches have shirked), that it is well intentioned and has some very smart policy makers, but when you fight markets and fundamentals, you have to capitulate at the end. No one is bigger than the Market, not even Ben Bernanke. The price of ETF is for bid/ask and no by intrinsic value of weight price bonds, no? How do you do to asses the intrinsic value of ETF? What are the limits to bond buying? The Fed can buy 100% of the issuance past and future if it so wishes (which could take it into negative equity but that's not as such a constraint for a central bank). Regarding the Fed's power to set rates, or lack of it, could there not be a halfway house between the Wizard of Oz and complete omnipotence, whereby the reality of the latter leads to the perception of the former? Think of a mafia boss, in The Godfather mould. If you knew nothing about the mafia, you might think the don's raised eyebrows and modest requests don't amount to much. You might conclude it's the fear of the mafia, rather than the reality, that causes people to listen to him. Every now and then the boss therefore has to go out and whack someone to remind everyone he means it. Overall, he has to whack less people than would otherwise be the case to get his point across, due to the fear this instills. I think it's similar with the Fed? The market knows what it will do and can do, and this shows up in attempts to pre-empt its action (=avoid getting whacked). This might reduce the apparent correlation, but in reality it's the fear of the very real power that in prompting people. I have one question over your investment philosophy: Do you follow the beta of your portfolio to look for portfolio's market neutral? THANK YOU for such an intelligent article!! I couldnt help but notice that in your grid of possible scenarios for stocks and bonds under various combinations of econ growth and inflation, there are four positive outcomes for stocks amd five negative. If ii assign equal probability to each (meaning i dont think i have the ability to handicap them.. Which i dont) the implicit message is to be cautious of stocks at the moment, no? You are right. The Fed has power but it's power is best left unused (as was the case with the Wizard of Oz). When markets look to the Fed for salvation, it is always troublesome. I don't look at the beta of my portfolio since there is little that it will alter. I try to find under valued companies across the spectrum and I think that will take care of my beta risk. And finally, I do think it is a time for caution (not panic or euphoria) on stocks. I think there's a feedback problem with the statement that inflation and real growth are better explanatory variables than Fed Funds rate. Doesn't Fed guidance and policy (in part, Fed Funds rate) determine inflation? At least for the period post-1981? In that case, wouldn't some of the Fed Funds rate impact manifest itself in the following inflation numbers? Also, I take issue with the vague proposition that today's Fed is impotent when pitted against long-term inflation. The Fed could only be so powerless if inflation stemmed from a currency depreciation spiral, which I have a hard time seeing while: (1) Japan engages in ultra-loose monetary policy, (2) China begins a difficult transition to consumption, and (3) Europe's productivity wanes under tight monetary policy. Lastly, do you have any suggestions for those of us looking at interest-rate sensitivity of different asset classes? I did not mean to suggest that the Fed has little power over inflation. In fact, it does affect inflation & real growth with its policies, but its effect is greater on the former rather than the latter. Real growth that comes from Fed actions has a short shelf life and a real growth that continues because of Fed support for the long term will almost always bring with it the risk of higher inflation. I noticed that your graph of fundamental interest rates starts at 1954. It's excellent to go back that far, but if you went back a 21 more years a different -- and more relevant -- story emerges. The Fed under Marriner Eccles pegged term rates from 1933 to 1951. During the late 40s these rates were well below inflation. To see, in a different context, a problem with the concept of a fundamental interest rate based on inflation and growth, independent of a central bank, consider Japan today. Imagine that Prime Minister Abe announced a 4% inflation target, instead of a 2% one. Imagine, further, that the market believed him. The net result would NOT be that interest rates would shoot up anywhere near 4%. For at a 4% interest rate, the government's debt servicing expense would exceed its total tax revenues. Instead of 4% rates, Japan would experience severe financial repression similar to its 1937-1947 period. More generally, the level of outstanding government debt, the composition of this debt, and the cost of servicing it, has a profound effect on the "natural rate" of interest. "Fiscal Dominance" regimes are essentially violations of the principal that rates must follow inflation. These non-Ricardian regimes have persisted for decades, if not generations. E.g., Italy from 1920s to 1980s. See Jens Weidmann's recent BIS paper. I would further maintain that the mere possibility of such a regime exerts enormous influence over asset prices. The inference from a Fundamental Interest Rate being equal to Inflation + Real Growth is that the the real risk free rate = real growth rate. Assuming there is no credit risk, the nominal risk free rate should be the inflation rate plus a little something (if you like a lenders share for financing the real growth; so definately below the real growth rate). And the little something over inflation would depend mostly on confidence in growth; with super high confidence in growth, it would tend to 0, so the nominal interest rate would be very close to the inflation rate. On the other hand, when confidence in growth is low, the little something extra over the inflation rate will tend towards real growth levels (lenders demand a higher share of growth because they believe the risk of growth being sustained is high). So in US during 2006, real growth was 2.38% and inflation 2.52%. If confidence in growth continuing at 2.38% had been high, the real interest rates would have been closer to 2.52%; while if confidence were low it would tend towards 4.9%. In normal times I suspect nominal rates would settle at inflation rate + a % of real growth depending on how the growth is financed (ie higher debt % of total capital used would pass more of the real growth to lenders). Using as India as an example, during period of high confidence we saw very low real interest rates for 10Y g-secs. This does not stack up with an expectation of real risk free rates tending towards real growth rates. when you invest in the distinct currency for example Embraer, did you hedge the currency? Great article (from a former student). It is hard to find true cause and effect for rates but your premise is certainly plausible. It is just cognitively easier to believe the Fed is controlling rates and stocks. Increases the certainty that things will be ok vs. "we are on our own". Is it fair to say given the scenarios that long SPY and TBT should work up until the 10-year gets to 5% or so? I think if investors focused on the level that typically comes with negative stock returns, they might not throw a taper tantrum when 10-year moves 50bps. The mortgage market along has started to rapidly adjust. Your post was very nice to us. Best stock to Buy Today. Thanks for the excellent article and blog. I'm assuming your reference to TBT is a long term bet against bonds. If so, how do you incorporate into you strategy the index drift that can happen with leveraged and inverse funds (e.g. http://news.morningstar.com/articlenet/article.aspx?id=272055)?